When should I schedule my senior pictures? I get asked this question quite frequently and wanted to shed some light on the subject. Officially, my senior season begins in the Spring of your JUNIOR year. If you are graduating in 2020, your senior photo session should be booked no later than June or July! And that may be cutting it short for a busy senior photographer. I start booking in February and am usually full for the season by the end of July. This does not mean your photos need to be done that early, but I highly recommend you book by July. I get calls every year in September looking to book fall senior photos and unfortunately, I have to turn them away because I am full. I start shooting in May and go up until the following March. If you are looking to book your shoot for fall, DO NOT WAIT until fall to book. You will have a difficult time finding a good photographer who is not full. Most high schools require you to have your yearbook photo submitted by October or November, and I have seen it as early as August or September. I keep a list of yearbook deadline dates for the local schools every year so I am kept in the loop. All of my packages include yearbook photo submission. It's my job to know when your yearbook photo is due. Not sure what season you want? Here are a few pointers for you…. Spring weather in Minnesota is beautiful! May flowers are blooming, the air is cool, and it is almost literally bug-free. Fun, beautiful sundresses and light clothing is the norm! 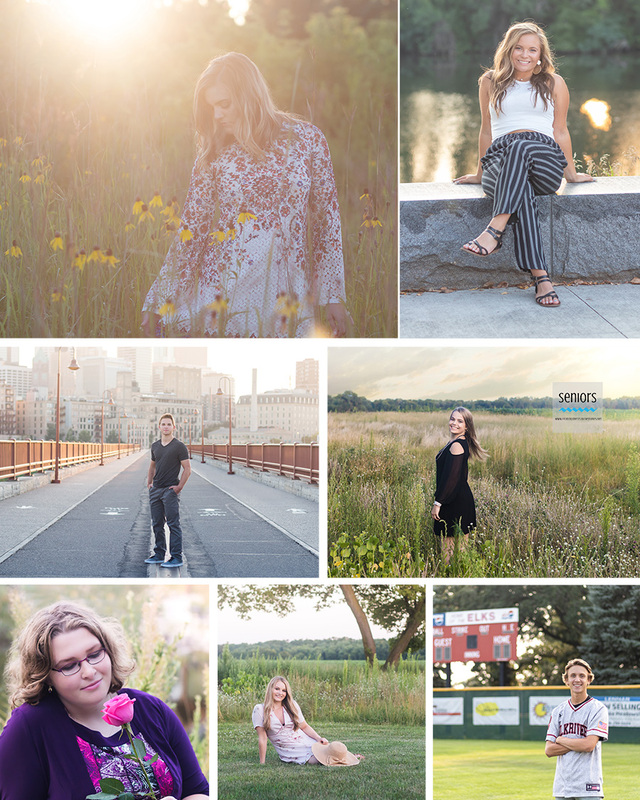 Those who get their photos done in May or June are able to enjoy their summer and not have to worry about their senior photos! Summer is definitely the most popular season for senior photos. Summer is hot. I’m not gonna lie. I shoot in the evenings so it is a little cooler, albeit more buggy. The golden hour lighting of summer cannot compare! It is the season of wide-brim hats and tall grass! Some of my favorite photos have been shot in the summer! Fall. What can I say about fall? My favorite time of year. “October is my favorite color.” The season of sweaters, boots, pea coats and beautiful scarves. If you are involved with after-school activities, please keep in mind that once school starts seniors are BUSY. Homecoming, sports, homework deadlines, college applications and visits, etc. Not to mention I am also very busy in the fall. My normal editing time is 2-3 weeks. Once August and September hit, it moves to 3-6 weeks. Please keep that in mind for yearbook submission deadlines. If we are in a pinch for editing time, I have edited the yearbook photo and sent it on through. Winter. Ah….Winter in Minnesota. I have to say my favorite senior session to date was shot in February. It was 12 degrees outside but you would never know it. There is something to be said for beautiful winter snow pictures. The lighting is absolutely fantastic in the winter and the snow? Well, that speaks for itself! Whichever time of year you choose, I have beautiful locations to compliment the season. Just remember to book your session early! I get asked this question quite frequently and wanted to shed some light on the subject. Officially, my senior season begins in the Spring of your JUNIOR year. If you are graduating in 2020, your senior photo session should be booked no later than June or July! And that may be cutting it short for a busy senior photographer. I start booking in February and am usually full for the season by the end of July. This does not mean your photos need to be done that early, but I highly recommend you book by July. I get calls every year in September looking to book fall senior photos and unfortunately, I have to turn them away because I am full. I start shooting in May and go up until the following March. Spring weather in Minnesota is beautiful! May flowers are blooming, it’s not too hot and it is almost literally bug-free. Not to mention those who get their photos done in May or June are able to enjoy their summer and not have to worry about their senior photos! Summer is hot. I’m not gonna lie. I still shoot, but it’s warmer. I shoot in the evenings so it is a little cooler, albeit more buggy. But some of my favorite photos have been shot in the summer! Fall. What can I say? My favorite time of year. “October is my favorite color.” If you are involved with after-school activities, please keep in mind that once school starts seniors are BUSY. Homecoming, sports, homework deadlines, college applications and visits, etc. Not to mention I am also very busy in the fall. My normal editing time is 2-3 weeks. Once August and September hit, it moves to 3-6 weeks. Please keep that in mind for yearbook submission deadlines. If we are in a pinch for editing time, I have edited the yearbook photo and sent it on through. Do not let that discourage you if you want fall photos. I will make it happen! Winter. Ah….Winter in Minnesota. I have to say my favorite senior session to date was shot in February. It was 12 degrees outside but you would never know it. There is something to be said for beautiful winter snow pictures. The lighting is absolutely fantastic in the winter!